Concept: This early to late successional mixedwood Vegetation Type (VT) has abundant white pine and red oak, a significant component of shade-intolerant hardwoods and a well-developed woody shrub layer. Red oak – White pine / Teaberry usually follows stand-replacing disturbances such as fire, windthrow or harvesting. Vegetation: White pine and red oak are the dominant overstory trees along with red maple, white birch and both aspen species. White pine may also occur in a super canopy position – residual survivors from past disturbance events. The shrub layer is primarily ericaceous species such as velvet-leaf blueberry, lowbush blueberry and lambkill along with regenerating white pine, red oak, black spruce and red maple. Other woody shrubs may include serviceberry, witch-hazel and wild raisin. 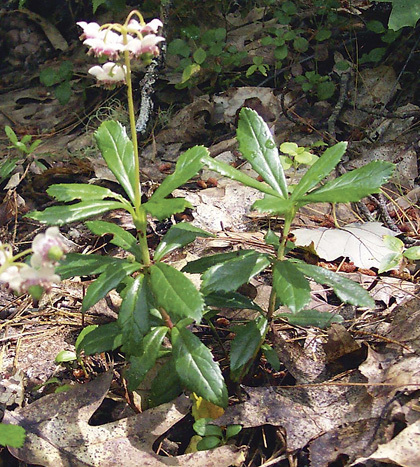 The herb layer includes many species associated with dry, poor sites such as teaberry, bracken, mayflower, cow-wheat, princes'-pine, poverty grass and round-leaved pyrola. The bryophyte layer is poorly developed. Environmental Setting: SP9 is mainly associated with dry to fresh, nutrient poor soils derived from granitic glacial till. Most sites also have moderate to extreme surface stoniness. This VT is abundant throughout the Western ecoregion, especially in the South Mountain, Western Barrens, Rossignol and Sable ecodistricts. This VT is uncommon in New Brunswick and absent from Prince Edward Island. Successional Dynamics: This VT is strongly shaped by past disturbances and the relatively dry, nutrient poor soils where it occurs. Historically, stand maintaining fires would have reduced understory fuel loads and promoted white pine and red oak dominance until the overstory was destroyed by an intense canopy fire. (Although the role of low intensity fires in red oak development is not well understood, it appears to have merit). 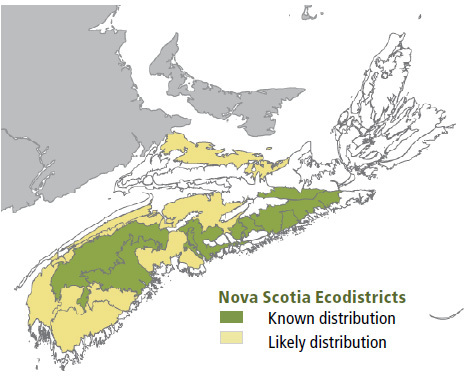 Successional VTs associated with SP9 include IH1 (Large-tooth aspen / Lambkill / Bracken), IH2 (Red oak – Red maple / Witch-hazel) and SP4a (White pine / Blueberry / Bracken variant Black spruce). 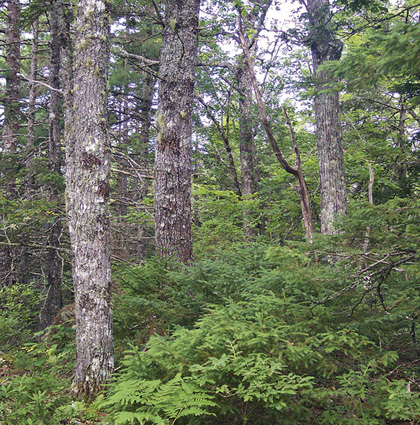 Ecological Features: This closed-canopy, small- to large-patch forest occurs on sites underlain by dry, nutrient poor, coarse soils derived from granites and quartzites. The longevity of the dominant tree species supports development opportunities for old growth forests, depending on the interval between stand initiating disturbances. Red oak is a valuable mast tree for wildlife species including squirrels, bear, ruffed grouse and deer. This tree has intermediate shade tolerance and will occur in both the understory and overstory. Regeneration of red oak is difficult; however young trees sprout vigorously following understory fire, providing a competitive advantage where this gap disturbance occurs. Oak is the preferred host of maitake, or hen-of-the-woods, a prized edible mushroom. Distinguishing Features: White pine and red oak are diagnostic of this hardwood-dominated mixedwood. Red maple, white birch and/or aspen are a significant component. The shrub and herb layer is indicative of poor and dry to fresh conditions. Round-leaved pyrola, princes'-pine, mayflower and teaberry are all good indicator species for this vegetation type.